It is a cement-based, polymer and fibre reinforced, highly strong, movement resistant plaster used in thermal insulation and plasting of polystyrene plates. It provides a very high strength with the tissue created in the fibre structure. 1 bag of (25 Kg) Forcechem® Thermal Insulation Board Plaster (Fibre) is mixed with 6,5-7 lt. water in a clean container until it gets mastic thickness. After reting the preparation for 5 minutes, it is mixed again. Preparation is applied on to surface by trowel at 2-2,5 mm thickness. After that plaster netting is applied. Plaster is left for drying. After is dried, last coat is applied at 1-1,5 mm according to the climatic conditions. For plastering the surfaces where flexibility is required. The surface should be moisted before application. Partical Size < 0,8 mm. Bunu Isı yalıtım sistem harçlarında Mineral sıvadan (mineral plaster) sonra koyalım. It is cement based and polymer added elastic and decorative ready-to-use plaster that looks like spreader and can be applied with a trowel at 1.6 -1.8mm (thin) and 2.5-3mm (thick) aggregate size. 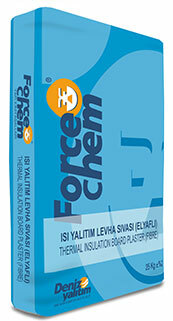 25 kg Forcechem® Mineral Plaster is mixed with 5,5-6 lt water in a clean can. The mixture is keps for 5 minutes and the mixed again. The Mixture can be applied to the surface with using trowel. Plaster must be applied to surface in equal thickness with using trowel and application thickness must be regulated with respect to biggest aggregate in mixture. Users have to make circular motion on plaster to give shape and design. It is not used metal surface, weak plaster surface and brick surface. The surface where plaster is to be applied should be clean, smooth and strong.